It is essential that the administration gets off to a strong start less the Taiwan Strait flashpoint boil over. Presidents George W. Bush and Barack Obama both failed to make available to Taiwan the arms needed to mount a credible self-defense. President Donald Trump and his team now have the opportunity to do a better job. It is essential they get off to a strong start. If nothing changes, the long simmering Taiwan Strait flashpoint is likely to boil over. It is difficult to overstate how dysfunctional America’s security policy is when it comes to democratic Taiwan. Despite China’s disquieting military buildup and expansionist posture, Washington has increasingly dithered on meeting its legal and moral commitments to Taiwan’s defense. The trouble began during the Bush administration, when Washington shocked Taipei by refusing to accept a letter of request for three squadrons of new F-16 fighter jets. 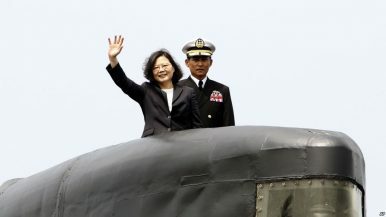 Things deteriorated further when the Bush White House proved unable to deliver on its promise to assist Taiwan in acquiring diesel-electric submarines at a price Taipei’s testy parliament could accept. Even worse, the administration tried to curtail the Ministry of National Defense’s homemade cruise missile project ― a legitimate capability needed for deterring Chinese ballistic missile strikes on Taiwan’s cities. The Obama administration delivered an even more lackluster performance. It refused Taiwan’s repeated requests for new fighter jets, while actively marketing low-end, cheap capabilities that seemed calculated to be inoffensive to China. In 2014, Taiwan’s government, by now aware of Washington’s self-limiting approach to Beijing, proudly announced its resolve to build its own submarines and invited America to join other countries in providing selected technical knowhow in a low-key fashion. The invitation backfired. In response, Obama’s team forbade the American defense industry from competing for access to the Indigenous Defense Submarine program. They then went on a rhetorical campaign to erode Taiwan’s confidence that it could and should go forward with the submarine build, which enjoyed widespread bipartisan support on the island. This was a remarkable reversal of what Pentagon experts under Clinton and Bush had previously counseled: namely, that submarines were an ideal asymmetric capability and necessary for defending against Chinese invasion. The absence of top-tier arms sales to Taiwan has directly contributed to an imbalanced security situation across the Strait. The American decisions to withhold support for a next generation Taiwanese air force and navy have negatively impacted the perceived reliability of the United States. This is true not just in Taipei, but also in Tokyo, where the Japanese foreign policy elite regard Taiwan’s fate as tightly intertwined with their own. China’s colossal armaments drive continues to erode the balance of power in the Taiwan Strait. Compounding the problem, the iron-fisted leader of China, Xi Jinping, has repeatedly hinted that an attack may be just over the horizon. After his turbulent rise to power in 2012, Xi ramped up covert actions and coercive operations against Taiwan. More recently, he has sent bombers and warships out on patrols that circled around the island. To be clear, there is no chance Taiwan will submit to being ruled by China. The Taiwanese people are rightfully proud of their democratic achievements and unimpressed with Beijing’s intimidation tactics. The blessings of self-determination and the power of nationalism are too deeply rooted for them to back down. Taiwan and China have had separate governments for 67 years, and this reality is almost certainly not going to change by 2021, or even by 2049. But a critical question remains: will Taiwan’s free future be secured by the pen or by the sword? To ensure that cross-strait conflict is averted, the Trump administration should make available to Taiwan new fighter jets, submarine technology, and many other weapons that have long been off the table. Few things would signal America’s restored strength and renewed sense of purpose to observers in Asia like frequent and high-caliber arms sales to Taiwan. Yes, China will bluster and complain, but Beijing will have only itself to blame. If Xi dismantled the offensive missiles he has pointed at Taiwan and declared his willingness to respect the will of its 23 million citizens, Taipei would undoubtedly invest its national resources differently. Unfortunately, the threat is likely to get much worse. The People’s Liberation Army (PLA), the armed wing of China’s Communist Party, has embarked on an ambitious reform program, with both Taiwan and America in its crosshairs. The PLA intends to transform itself into a joint fighting force that is capable of invading and occupying Taiwan while simultaneously defeating the U.S. Pacific Fleet. This is an extremely tall order. It nonetheless represents a disturbing indication of intent. PLA reforms will probably take a decade or more to succeed ― if they can succeed at all. In the meantime, few options are as likely to make China think twice about the cost of aggression as bolstered arms sales. To keep the Asia-Pacific region peaceful and prosperous, the United States needs a well defended and confident Taiwan. President Trump and his new team have their work cut out for them. Fixing the policy mistakes of the past will take a concerted effort. Their prospects will be excellent if they cast off the legacy they have inherited and chart a new course. Ian Easton is a research fellow at the Project 2049 Institute and author of the forthcoming book, The Chinese Invasion Threat: Taiwan’s Defense and American Strategy in Asia.